A term used six times in the A. V. as a translation of the Hebrew words , and . It is everywhere rendered resina in the Vulgate.The margin of the A. V. in Ezek. xxvii. 17 reads "rosin." 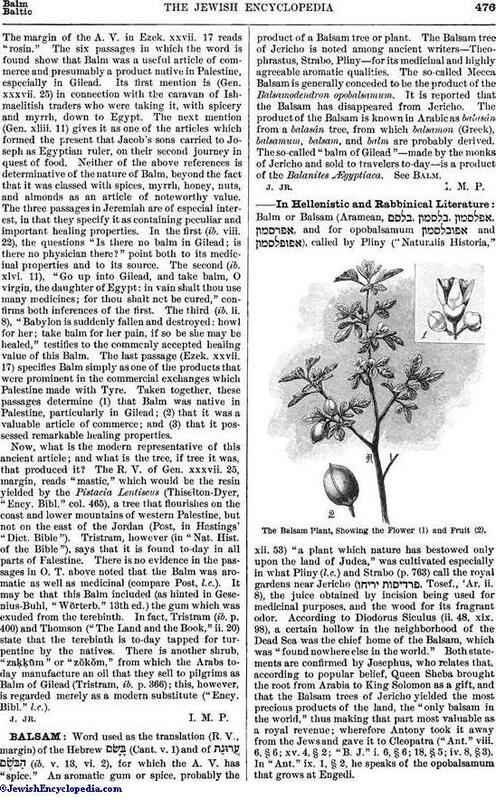 The six passages in which the word is found show that Balm was a useful article of commerce and presumably a product native in Palestine, especially in Gilead. Its first mention is (Gen. xxxvii. 25) in connection with the caravan of Ishmaelitish traders who were taking it, with spicery and myrrh, down to Egypt. The next mention (Gen. xliii. 11) gives it as one of the articles which formed the present that Jacob's sons carried to Joseph as Egyptian ruler, on their second journey in quest of food. Neither of the above references is determinative of the nature of Balm, beyond the fact that it was classed with spices, myrrh, honey, nuts, and almonds as an article of noteworthy value. The three passages in Jeremiah are of especial interest, in that they specify it as containing peculiar and important healing properties. In the first (ib. viii. 22), the questions "Is there no balm in Gilead; is there no physician there?" point both to its medicinal properties and to its source. The second (ib. xlvi. 11), "Go up into Gilead, and take balm, O virgin, the daughter of Egypt: in vain shalt thou use many medicines; for thou shalt not be cured," confirms both inferences of the first. The third (ib. li. 8), "Babylon is suddenly fallen and destroyed: howl for her; take balm for her pain, if so be she may be healed," testifies to the commonly accepted healing value of this Balm. The last passage (Ezek. xxvii. 17) specifies Balm simply as one of the products that were prominent in the commercial exchanges which Palestine made with Tyre. Taken together, these passages determine (1) that Balm was native in Palestine, particularly in Gilead; (2) that it was a valuable article of commerce; and (3) that it possessed remarkable healing properties. Now, what is the modern representative of this ancient article; and what is the tree, if tree it was, that produced it? The R. V. of Gen. xxxvii. 25, margin, reads "mastic," which would be the resin yielded by the Pistacia Lentiscus (Thiselton-Dyer, "Ency. Bibl." col. 465), a tree that flourishes on the coast and lower mountains of western Palestine, but not on the east of the Jordan (Post, in Hastings' "Dict. Bible"). Tristram, however (in "Nat. Hist. of the Bible"), says that it is found to-day in all parts of Palestine. There is no evidence in the passages in O. T. above noted that the Balm was aromatic as well as medicinal (compare Post, l.c.). It may be that this Balm included (as hinted in Gesenius-Buhl, "Wörterb." 13th ed.) 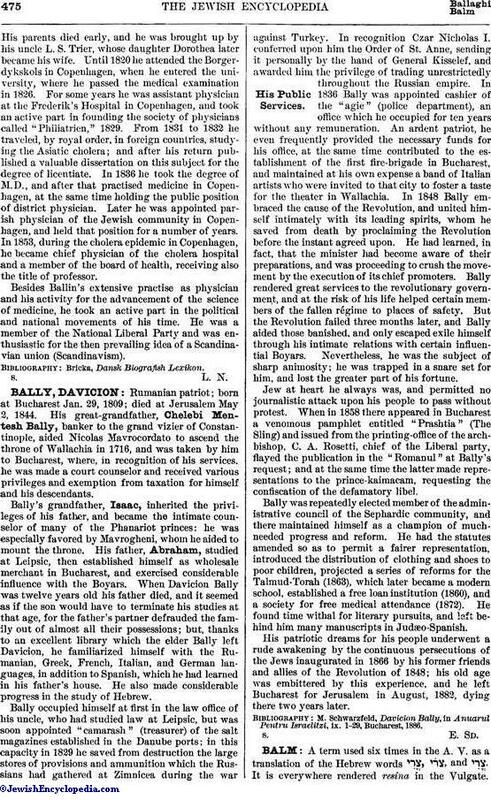 the gum which was exuded from the terebinth. In fact, Tristram (ib. p. 400) and Thomson ("The Land and the Book," ii. 20) state that the terebinth is to-day tapped for turpentine by the natives. There is another shrub, "zaḳḳūm" or "zŏkŏm," from which the Arabs today manufacture an oil that they sell to pilgrims as Balm of Gilead (Tristram, ib. p. 366); this, however, is regarded merely as a modern substitute ("Ency. Bibl." l.c. ).